Bette Midler (born December 1, 1945) is an American singer, songwriter, actress, comedian, and film producer. Born in Honolulu, Hawaii, Midler began her professional career in several Off-Off-Broadway plays, prior to her engagements in Fiddler on the Roof and Salvation on Broadway in the late 1960s. She came to prominence in 1970 when she began singing in the Continental Baths, a local gay bathhouse where she managed to build up a core following. Since 1970, Midler has released 14 studio albums as a solo artist. Throughout her career, many of her songs became hits on the record charts, including her renditions of "The Rose", "Wind Beneath My Wings", "Do You Want to Dance", "Boogie Woogie Bugle Boy", and "From a Distance". In 2008, she signed a contract with Caesars Palace in Las Vegas to perform a series of shows titled Bette Midler: The Showgirl Must Go On, that ended in January 2010. Midler made her motion picture debut in 1979 with The Rose, which earned her a Golden Globe for Best Actress. In the following years, she starred in a string of hit films, including: Down and Out in Beverly Hills, Outrageous Fortune, Beaches, The First Wives Club, and The Stepford Wives. She starred in For the Boys and Gypsy, and won two additional Golden Globe awards for these films. In a career spanning almost half a century, Midler has won three Grammy Awards, four Golden Globes, three Emmy Awards, and a special Tony Award. She has sold over 35 million records worldwide, and has received four Gold, three Platinum, and three Multiplatinum albums by RIAA. 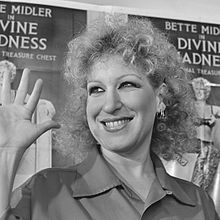 Midler is currently appearing on Broadway in a revival of Hello, Dolly!, which began preview performances on March 15, 2017 and premiered at the Shubert Theatre on April 20, 2017. It is her first leading role in a Broadway musical. 2.7 2012–present: Parental Guidance, I'll Eat You Last: A Chat With Sue Mengers, and It's the Girls! Midler was born in Honolulu, where her family was one of the few Jewish families in a mostly Asian neighborhood. Her mother, Ruth (née Schindel; b. 1916, New Jersey), was a seamstress and housewife, and her father, Fred Midler (b. 1912, New Jersey), worked at a Navy base in Hawaii as a painter, and was also a housepainter. She was named after actress Bette Davis, though Davis pronounced her first name in two syllables, and Midler uses one, /ˈbɛt/. She was raised in Aiea and attended Radford High School, in Honolulu. She was voted "Most Talkative" in the 1961 school Hoss Election, and "Most Dramatic" in her senior year (class of 1963). Midler majored in drama at the University of Hawaii at Manoa, and was a sister of Delta Phi Epsilon international sorority, but left after three semesters. She earned money in the 1966 film Hawaii as an extra, playing an uncredited seasick passenger named Miss David Buff. Midler married artist Martin von Haselberg on December 16, 1984, about six weeks after their first meeting. Their daughter, Sophie von Haselberg, who is also an actress, was born on November 14, 1986. Midler relocated to New York City in the summer of 1965, using money from her work in the film Hawaii. She landed her first professional onstage role in Tom Eyen's Off-Off-Broadway plays in 1965, Miss Nefertiti Regrets and Cinderella Revisited, a children's play by day and an adult show by night. From 1966 to 1969, she played the role of Tzeitel in Fiddler on the Roof on Broadway. After Fiddler, she joined the original cast of Salvation in 1969. She began singing in the Continental Baths, a gay bathhouse in the Ansonia Hotel, in the summer of 1970. During this time, she became close to her piano accompanist, Barry Manilow, who produced her first album in 1972, The Divine Miss M. It was during her time at the Continental Baths that she built up a core following. In the late 1990s, during the release of her album Bathhouse Betty, Midler commented on her time performing there, "Despite the way things turned out [with the AIDS crisis], I'm still proud of those days. I feel like I was at the forefront of the gay liberation movement, and I hope I did my part to help it move forward. So, I kind of wear the label of 'Bathhouse Betty' with pride." Midler starred in the first professional production of the Who's rock opera Tommy in 1971, with director Richard Pearlman and the Seattle Opera. It was during the run of Tommy that Midler first appeared on The Tonight Show. Midler released her debut album, The Divine Miss M, on Atlantic Records in December 1972. The album was co-produced by Barry Manilow, who was Bette's arranger and music conductor at the time. It reached Billboard's Top 10 and became a million-selling Platinum-certified album, earning Midler the 1973 Grammy Award for Best New Artist. It featured three hit singles—"Do You Wanna Dance? ", "Friends", and "Boogie Woogie Bugle Boy"—the third of which became Midler's first No. 1 Adult Contemporary hit. "Bugle Boy" became a successful rock cover of the classic swing tune originally introduced and popularized in 1941 by the famous Andrews Sisters, to whom Midler has repeatedly referred as her idols and inspiration, as far back as her first appearances on The Tonight Show Starring Johnny Carson. Midler told Carson in an interview that she always wanted to move like the sisters, and Patty Andrews remembered: "When I first heard the introduction on the radio, I thought it was our old record. When Bette opened at the Amphitheater in Los Angeles, Maxene and I went backstage to see her. Her first words were, 'What else did you record?'" During another Midler concert, Maxene went on stage and presented her with an honorary bugle. Bette recorded other Andrews Sisters hits, including "In the Mood" and "Lullaby of Broadway". Her self-titled follow-up album was released at the end of 1973. Again, the album was co-produced by Manilow. It reached Billboard's Top 10 and eventually sold close to a million copies in the United States alone. Midler returned to recording with the 1976 and 1977 albums, Songs for the New Depression and Broken Blossom. In 1974, she received a Special Tony Award for her contribution to Broadway, with Clams on the Half Shell Revue playing at the Minskoff Theater. From 1975–1978, she also provided the voice of Woody the Spoon on the PBS educational series Vegetable Soup. 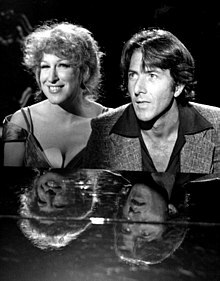 In 1977, Midler's first television special, whose title, Ol' Red Hair is Back, was a takeoff on Frank Sinatra's Ol' Blue Eyes Is Back, premiered, featuring guest stars Dustin Hoffman and Emmett Kelly. It went on to win the Emmy Award for Outstanding Special — Comedy-Variety or Music. Midler made her first motion picture in 1979, starring in the 1960s-era rock and roll tragedy The Rose, as a drug-addicted rock star modeled after Janis Joplin. That year, she also released her fifth studio album, Thighs and Whispers. Midler's first foray into disco was a commercial and critical failure and went on to be her all-time lowest charting album, peaking at No. 65 on the Billboard album chart. Soon afterward, she began a world concert tour, with one of her shows in Pasadena being filmed and released as the concert film Divine Madness (1980). Her performance in The Rose earned her a nomination for Academy Award for Best Actress, a role for which she won the Golden Globe for Best Actress (Comedy or Musical). The film's acclaimed soundtrack album sold over two million copies in the United States alone, earning a Double Platinum certification. The single version of the title song, which Amanda McBroom had written and composed, held the No. 1 position on Billboard's Adult Contemporary chart for five consecutive weeks and reached No. 3 on Billboard's Hot 100. It earned Midler her first Gold single and won the Grammy award for Best Pop Vocal Performance, Female. Midler worked on the troubled comedy project Jinxed! in 1981. However, during production, there was friction with co-star Ken Wahl and the film's director, Don Siegel. Released in 1982, the film was a major flop. Midler did not appear in any other films until 1986. During those four years, she concentrated on her music career and in 1983, released the album No Frills, produced by Chuck Plotkin, who was best known for his work with Bob Dylan and Bruce Springsteen. The album included three single releases: the ballad "All I Need to Know", a cover of Detroit native Marshall Crenshaw's "You're My Favorite Waste of Time"—which Midler fell in love with after flipping his 45 of "Someday Someway"—and Midler's take on the Rolling Stones cover "Beast of Burden". She also released an all-comedy album (with a few songs tied into the comedy) called "Mud Will Be Flung Tonight" in 1985. Midler performed on USA for Africa's 1985 fund-raising single "We Are the World", and participated at the Live Aid event at JFK Stadium in Philadelphia. Also in 1985, she signed a multi-picture deal with the Walt Disney Studios, where she starred in a string of successful films produced by the studio's newly formed Touchstone Pictures division. She also produced them through her production banner, All Girl Productions. She was subsequently cast by director Paul Mazursky in Down and Out in Beverly Hills, beginning a successful comedic acting career. She followed that role with several more Touchstone comedies, Ruthless People (1986), Outrageous Fortune (1987), and Big Business (1988). Later in 1988, Midler lent her voice to the animated character Georgette, a snobbish poodle, in Disney's Oliver & Company, and had a hit with the tearjerker Beaches, co-starring Barbara Hershey. The accompanying soundtrack remains Midler's all-time biggest selling disc, reaching No. 2 on Billboard's album chart and with U.S. sales of four million copies. It featured her biggest hit, "Wind Beneath My Wings", which went to No. 1 on Billboard's Hot 100, achieved Platinum status, and won Midler her third Grammy Award – for Record of the Year – at the 1990 telecast. Midler's 1990 cover of the Julie Gold song "From a Distance", the first offering from her seventh studio album Some People's Lives (1990), topped the Billboard Adult Contemporary charts and achieved platinum status in the US. The same year, she starred along with Trini Alvarado as the title character in John Erman's drama film Stella. The third feature film adaptation of the 1920 novel Stella Dallas by Olive Higgins Prouty, Midler portrayed a vulgar single mother living in Watertown, New York, who, determined to give her daughter all the opportunities she never had, ultimately makes a selfless sacrifice to ensure her happiness. The movie scored mediocre reviews, while Midler received her first Razzie Award nomination for Worst Actress. She co-starred with Woody Allen in the 1991 film Scenes from a Mall, again for Paul Mazursky. In the film, Allen's character reveals to his author wife Deborah, played by Midler, after years of a happy marriage, that he has had an affair, resulting in her request for divorce. The movie performed poorly, and received a mixed reception by critics. Midler fared somewhat better with her other 1991 project For the Boys, on which she reteamed with The Rose director Mark Rydell. A historical musical drama, it tells the story of 1940s actress and singer Dixie Leonard, played by Midler, who teams up with Eddie Sparks, a famous performer to entertain American troops. While the film received a mixed reception from critics, Midler earned rave review for her portrayal. The following year she was awarded her second Golden Globe and received her second Academy Award nomination for Best Actress. Midler turned down the lead role in the musical comedy Sister Act in 1992, which instead went to Whoopi Goldberg. Midler won an Emmy Award in 1992 for her performance on the penultimate episode of The Tonight Show Starring Johnny Carson in May 1992, during which she sang an emotion-laden "One for My Baby (and One More for the Road)" to Johnny Carson. That night, Midler began singing "Here's That Rainy Day", Carson's favorite song; Carson joined in a few lyrics later. In 1993, she starred with Sarah Jessica Parker and Kathy Najimy in the Walt Disney comedy fantasy film, Hocus Pocus, as Winifred Sanderson, the head witch of the Sanderson Sisters. Released to initially mixed reviews, through various outlets such as strong DVD sales and annual record-breaking showings on 13 Nights of Halloween, the film has achieved cult status over the years. 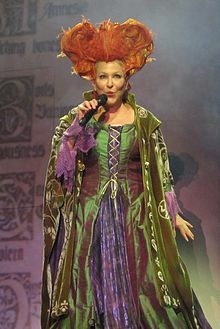 In relation to Hocus Pocus, every year Midler hosts her annual Hulaween costume party, which benefits the New York Restoration Project. Her television work includes an Emmy-nominated version of the stage musical Gypsy and a guest appearance as herself in Fran Drescher's The Nanny. She appeared on Seinfeld in the 1995 episode "The Understudy", which was the season finale of that show's sixth season in 1995. That same year, Midler had a supporting role in Get Shorty. Her 1997 HBO special Diva Las Vegas earned her a third Emmy Award, for Outstanding Performance in a Variety or Music Program. Midler's other 1990s films include The First Wives Club (1996). In 1997, Midler, along with her co-stars from The First Wives Club, Goldie Hawn, and Diane Keaton, was a recipient of the Women in Film Crystal Award, which honors "outstanding women who, through their endurance and the excellence of their work, have helped to expand the role of women within the entertainment industry." Midler starred in her own sitcom in 2000, Bette, which featured Midler playing herself, a divine celebrity who is adored by her fans. Airing on CBS, initial ratings were high, marking the best sitcom debut for the network in more than five years, but viewers percentage soon declined, resulting in the show's cancellation in early 2001. Midler openly griped about the show's demanding shooting schedule, while the show itself was also reportedly rocked by backstage turmoil, involving the replacement of co-star Kevin Dunn whose departure was attributed to his behind-the scenes bickering with Midler by the media. However, Midler, critically praised, was awarded a People's Choice Award for her performance in the show and received a Golden Globe Award nomination the following year. Also in 2000, Midler made an uncredited cameo appearance in Nancy Meyers' fantasy rom–com What Women Want, starring Mel Gibson and Helen Hunt. In the film, she portrayed a therapist who realizes that central character Nick, played by Gibson, is able to understand women's thoughts. Released to generally mixed reviews, it became the then-most successful film ever directed by a woman, taking in $183 million in the United States, and grossing upward of $370 million worldwide. The same year Midler starred in Isn't She Great and Drowning Mona. In Andrew Bergman's Isn't She Great, a highly fictionalized account of the life and career of author Jacqueline Susann, she played alongside Nathan Lane and Stockard Channing, portraying Susann with her early struggles as an aspiring actress relentlessly hungry for fame, her relationship with press agent Irving Mansfield, her success as the author of Valley of the Dolls, and her battle with and subsequent death from breast cancer. The dramedy garnered largely negative reviews by critics, who dismissed it as "bland material produces entirely forgettable comic performances." For her performance in the film, Midler received her second Golden Raspberry Award nomination for Worst Actress at the 21st ceremony. In Nick Gomez's dark comedy Drowning Mona, Midler appeared along with Danny DeVito and Jamie Lee Curtis, playing title character Mona Dearly, a spiteful, loud-mouthed, cruel and highly unpopular woman, whose mysterious death is investigated. Another critical fiasco, reviewers noted that the film "drowns itself in humor that never rises above sitcom level." Bette or Bust, a book chronicling Midler's Divine Miss Millennium Tour, was released in 2001. After nearly three decades of erratic record sales, Midler was dropped from the Warner Music Group in 2001. Following a reported long-standing feud with Barry Manilow, the two joined forces after many years in 2003 to record Bette Midler Sings the Rosemary Clooney Songbook. Now signed to Columbia Records, the album was an instant success, being certified gold by RIAA. One of the Clooney Songbook selections, "This Ole House", became Midler's first Christian radio single shipped by Rick Hendrix and his positive music movement. The album was nominated for a Grammy the following year. Throughout 2003 and 2004, Midler toured the United States in her new show, Kiss My Brass, to sell-out audiences. Also in 2004, she appeared in a supporting role in Frank Oz' science fiction satire The Stepford Wives, a remake of the 1975 film of the same name also based on the Ira Levin novel. Also starring Nicole Kidman, Matthew Broderick, Christopher Walken and Glenn Close, Midler played Bobbie Markowitz, a writer and recovering alcoholic. The project underwent numerous production problems that occurred throughout its shooting schedule, with reports of problems on-set between director Oz and the actors being rampant in the press. Oz later blamed Midler — who was amid recording her next album and rehearsing for her tour — for being under a lot of stress by other projects and making "the mistake of bringing her stress on the set." While the original book and film had tremendous cultural impact, the remake was marked by poor reviews by many critics, and a financial loss of approximately $40 million at the box office. An Australian tour in early 2005, Kiss My Brass Down Under, was equally successful. Midler joined forces again with Manilow for another tribute album, Bette Midler Sings the Peggy Lee Songbook. Released in October 2005, the album sold 55,000 copies the first week of release, returned Midler to the top ten of US Billboard 200, and was nominated for a Grammy Award. Midler released a new Christmas album titled Cool Yule in 2006, which featured a duet of Christmastime pop standards "Winter Wonderland"/"Let It Snow" with Johnny Mathis. Well-received, the album garnered a Grammy Award nomination for Best Traditional Pop Vocal Album in 2007. The same year, Midler returned to the big screen, appearing in Then She Found Me, Helen Hunt's feature film directorial debut. Also starring Hunt along with Matthew Broderick and Colin Firth, the comedy-drama film tells the story of a 39-year-old Brooklyn elementary school teacher, who after years is contacted by the flamboyant host of a local talk show, played by Midler, who introduces herself as her biological mother. Critical response to the film was mixed; whereas some critics praised the film for having strong performances, others felt the film was bogged down by a weak script and technical issues. Midler debuted her Vegas show titled Bette Midler: The Showgirl Must Go On at The Colosseum at Caesars Palace on February 20, 2008. It comprised The Staggering Harlettes, 20 female dancers called The Caesar Salad Girls and a 13-piece band. The show played its final performance on January 31, 2010, and was nominated for a Primetime Emmy Award for Outstanding Variety, Music, or Comedy Special in 2011. Also in 2008, another compilation album by Midler, Jackpot: The Best Bette, was released. It reached number 66 on the U.S. Billboard 200 chart, and number six in the United Kingdom, where it was certified platinum for sales of over 300,000 copies. As her only film appearance that year, Midler had a small role in Diane English's comedy film The Women, starring Meg Ryan, Annette Bening and Eva Mendes among others. An updated version of the George Cukor-directed 1939 film of the same name based on a 1936 play by Clare Boothe Luce, the film was widely panned by critics, who found it "...a toothless remake of the 1939 classic, lacking the charm, wit and compelling protagonists of the original." Midler appeared on the Bravo TV show My Life on the D-List with Kathy Griffin in an episode that aired in June 2009. In December of the same year, she appeared in the Royal Variety Performance, an annual British charity event attended by Queen Elizabeth II. Midler performed "In My Life" and "Wind Beneath My Wings" as the closing act. In 2010, Midler voiced the character Kitty Galore in the animated film Cats & Dogs: The Revenge of Kitty Galore. The film was a success, grossing $112 million worldwide. In November 2010, Midler released Memories of You, another compilation of lesser known tracks from her catalog. Midler was one of the producers of the Broadway production of the musical Priscilla, Queen of the Desert, which opened in February 2011. 2012–present: Parental Guidance, I'll Eat You Last: A Chat With Sue Mengers, and It's the Girls! In June 2012, Midler received the Sammy Cahn Lifetime Achievement Award at the Songwriters Hall of Fame in New York in recognition of her having "captivated the world" with her "stylish presentation and unmistakable voice." The same year, she co-starred alongside Billy Crystal in the family movie Parental Guidance (2012), playing a couple of old school grandparents trying to adapt to their daughter's 21st-Century parenting style. Despite generally negative reviews by critics, who felt the film was "sweet but milquetoast", box office totals for the movie were higher than expected. In 2013, Midler performed on Broadway for the first time in more than 30 years in a play about the Hollywood superagent Sue Mengers. The play, titled I'll Eat You Last: A Chat with Sue Mengers and dramatized by John Logan, opened on April 24, 2013 at the Booth Theatre. After the show's success in New York, recouping its initial $2.4 million investment, it was decided to perform the play in Los Angeles at the Geffen Playhouse. In December 2013, it was announced that Midler would portray Mae West in an HBO movie biography, written by Harvey Fierstein and directed by William Friedkin. In March 2014, she performed at the 86th Academy Awards telecast at the Dolby Theatre in Los Angeles, singing "Wind Beneath My Wings". Midler formed and announced plans to release an all-girl group album at the end of 2014, with further plans of doing a tour. It was announced on September 23, 2014, that Midler would be releasing her 25th overall album, It's the Girls!, on November 4, 2014, through Warner Bros. Records. The album spans seven decades of famous girl groups, from 1930s trios The Boswell Sisters (the title track) and The Andrews Sisters ("Bei Mir Bist Du Schön") to 1990s R&B legends TLC's "Waterfalls". In March 2017, she began playing the role of Dolly Gallagher Levi in the Broadway revival of Hello, Dolly! She plays the role of Muv in the 2017 film Freak Show. In 1991, Midler was an early sponsor of the Adopt-a-Highway, paying $2,000 a month for a crew to clean up a 2-mile section of the Ventura Freeway in Burbank, California. Signs at both ends of the section read "Litter Removal Next 2 Miles, Bette Midler." The location was so prominent, it became fodder for her 1993 guest appearance on the Simpsons episode "Krusty Gets Kancelled", where she is seen picking up trash along a stretch of highway she has adopted, and causes car crashes for drivers who deliberately litter. In 1995, she carried the same idea to the east coast, adopting a section of the Long Island Expressway and Bronx River Parkway. Midler founded the New York Restoration Project (NYRP) in 1995, a non-profit organization with the goal of revitalizing neglected neighborhood parks in economically disadvantaged neighborhoods of New York City. These include Highbridge Park, Fort Washington Park, and Fort Tryon Park in upper Manhattan and Roberto Clemente State Park and Bridge Park in the Bronx. When the city planned in 1991 to auction 114 community gardens for commercial development, Midler led a coalition of greening organizations to save them. NYRP took ownership of 60 of the most neglected plots. Today, Midler and her organization work with local volunteers and community groups to ensure that these gardens are kept safe, clean and vibrant. In 2003, Midler opened Swindler Cove Park, a new 5-acre (20,000 m2) public park on the Harlem River shore featuring specially designed educational facilities and the Peter Jay Sharp Boathouse, the first community rowing facility to be built on the Harlem River in more than 100 years. The organization offers free in-school and after-school environmental education programming to students from high-poverty Title I schools. In 2001, she established after 9/11, programs run by her foundation which helps wounded service members and their families by providing them resources, including custom homes. One of these programs helps service members recovering from trauma, injury and loss. Also, ever since the first Gulf War she goes to the USO and on bases to show her gratitude to military members by serving them meals just before deployment. 1994: Experience the Divine Again! In 1981 the album In Harmony: A Sesame Street Record won the Grammy for Best Recording for Children, Midler was one of the various artists featured. This Grammy was awarded to the producers, David Levine and Lucy Simon. "Wind Beneath My Wings" also won the Grammy for Song of the Year. This Grammy was awarded to the songwriters, Larry Henley and Jeff Silbar. "From a Distance", recorded by Midler in 1990, won that year's Grammy for Song of the Year. This Grammy was awarded to the songwriter, Julie Gold. Bette Midler: A View From a Broad (Simon & Schuster, 1980, Updated edition April 1, 2014). The Saga of Baby Divine (Crown Publishers, 1983). ^ "Bette Midler Biography (1945-)". FilmReference.com. Retrieved 2013-12-10. Source notes: "Born December 1, 1945, in Paterson, NJ (some sources cite Honolulu, HI or Aiea, HI); raised in Aiea, HI". ^ Sinead Garvan (November 26, 2010). "Bette Midler: I wouldn't make it now". BBC News. Retrieved 2011-07-25. ^ "Gold & Platinum Searchable Database - August 01, 2014". RIAA. Retrieved 2014-08-01. ^ a b Viagas, Robert (January 10, 2017). "Bette Midler’s Hot-Ticket Hello, Dolly! Adds Two Performances". Playbill. ^ Ale Russian, "Hello, Bette! See the First Photo of Bette Midler in Hello, Dolly! Broadway Revival," People, March 14, 2017. ^ Kaitlin Fontana, "Here’s Your First Look at Bette Midler in Hello, Dolly!," Vulture, March 15, 2017. ^ Ruhlmann, William. "Artist Biography Bette Midler". AllMusic.com. Retrieved November 26, 2014. ^ Dove, Ian (December 4, 1973). "Stage: Miss M. Devine". The New York Times. Retrieved November 26, 2014. Despite Bette Midler's Honolulu birthplace, New York has always regarded her as homegrown and hometown. ^ "The Religious Affiliation of Singer, Actress, Comedian Bette Midler". Adherents.com. October 8, 2005. Retrieved 2011-07-25. ^ "Bette Midler, Biography (1945–)". FilmReference.com. Retrieved 2011-07-28. ^ "Bette Midler: The Divine Miss Bubbe". Jewish Journal. 2012-12-12. Retrieved 2012-12-18. ^ The Class of 1963! We're Radgrads! Archived May 1, 2008, at the Wayback Machine. ^ High School Hoss Elections Archived February 5, 2005, at the Wayback Machine. ^ 5, Jennifer McCall on Feb; Celebrity, 2014 in (2014-02-05). "Greek life: famous fraternity brothers and sorority sisters (25 photos)". theBERRY. Retrieved 2017-02-27. ^ "Bette Midler: 62 and Heading for Vegas!". The Oprah Winfrey Show. January 28, 2008. Harpo Productions, Inc.
^ "Bette Midler". Jewish Women's Archive. Retrieved 2011-07-25. ^ a b Richard Corliss (March 17, 2004). "That Old Feeling: Best Bette Yet". Time. Archived from the original on February 21, 2011. Retrieved 2011-07-25. ^ "Bette Midler". BroadwayWorld.com. Retrieved 2011-07-28. ^ "Bette Midler". Houston Voice. DelveIntoTheDevine.com. October 23, 1998. Retrieved 2011-07-28. ^ Melinda Bargreen (July 22, 2005). "Glynn Ross, 90, turned Seattle into opera destination". The Seattle Times. Seattletimes.com. Archived from the original on May 24, 2011. Retrieved 2011-07-25. ^ a b c d "Gold & Platinum Searchable database-Bette Midler". Recording Industry Association of America. Retrieved 2011-07-28. ^ a b c "Past Winners Search-Midler". Grammy.com. Retrieved 2011-07-28. ^ a b Sforza, John: "Swing It! The Andrews Sisters Story" University Press of Kentucky, 2000; 289 pages. ^ Joel Whitburn (May 1, 2002). Top Adult Contemporary 1961–2001. Menomonee Falls, Wisconsin: Record Research, Inc. 3rd edition. p. 170. ISBN 978-0-89820-149-9. ^ "Search Past Winners-1974". TonyAwards.com. Retrieved August 23, 2010. ^ "Bette Midler". Emmys.com. Retrieved 2012-12-18. ^ "Thighs and Wispers". betteontheboards.com. Retrieved 2011-07-25. ^ "Bette Midler". Box Office Mojo. Box Office Mojo. Retrieved 13 April 2015. ^ "'We Are The World' Tune Brings Out The Best of America's 46 Stars". Jet. Google Books. February 18, 1985. p. 16. Retrieved 2011-07-28. ^ Maslin, Janet (February 2, 1990). "MOVIE REVIEWS : Melodrama: Was this 'Stella,' a loony Midler remake, really necessary?". Los Angeles Times. Retrieved 2012-06-10. ^ "Stella". Chicago Sun Times. Retrieved 2012-06-10. ^ Broeske, Pat H. (February 26, 1991). "THREE-DAY WEEKEND BOX OFFICE : A Replay of the Top Fhree". Los Angeles Times. Retrieved 2012-06-10. ^ Canby, Vincent (February 22, 1991). "Review/Film; A Marriage On and Off The Rocks". The New York Times. Retrieved 2012-06-10. ^ "Scenes from a Mall". Chicago Sun-Times. Retrieved 2012-06-10. ^ Rainer, Peter (February 22, 1991). "MOVIE REVIEW : Down and Out in Beverly Center : A Slice of L.A.--Without the Bite". Los Angeles Times. Retrieved 2012-06-10. ^ Lynn Hirschburg (October 8, 2000). "Meta-Midler". New York Times. p. 14. Retrieved 2011-07-25. ^ Bill Saporito (March 31, 2003). "Great Performances to Savor". Time. Retrieved 2011-07-25. ^ "Five Reasons Why 'Hocus Pocus' is One of the Greatest Cult Classic Films". International Business Times. Retrieved 2011-11-03. ^ "ABC Family's "13 Nights of Halloween 2011" Scares Up Record Crowd". TV By the Numbers. Archived from the original on November 6, 2011. Retrieved 2011-11-03. ^ "HOCUS POCUS – Where are they now?". Oh No They Didn't. Retrieved 2011-11-03. ^ "Bette Midler's Hulaween Party to Celebrate 20th Anniversary: See Her Best Costumes!". Us Weekly. Retrieved 3 November 2015. ^ "Past Recipients". wif.org. Archived from the original on August 20, 2011. Retrieved May 9, 2011. ^ a b "CBS Reportedly Cancels 'Bette'". ABC News. ABC News. March 6, 2001. Retrieved 2010-02-18. ^ a b McCarthy, Todd (December 10, 2000). "What Women Want review". Variety. Retrieved 2012-10-01. ^ Griffin, Nancy (December 14, 2003). "Diane Keaton Meets Both Her Matches". The New York Times. Retrieved 2010-02-02. ^ Kaufman, Amy (January 1, 2010). "No Complications For Meyers". Los Angeles Times. Retrieved 2010-02-18. ^ "Isn't She Great (2000)". RottenTomatoes. RottenTomatoes.com. Retrieved 2012-10-01. ^ "Drowning Mona (2000)". RottenTomatoes. RottenTomatoes.com. Retrieved 2012-10-01. ^ "Complete list of 46th annual Grammy winners and nominees". Chicago Tribune. Associated Press. Retrieved February 11, 2012. ^ "Nicole Kidman-Frank Oz's Tense Remake". contactmusic.com. February 10, 2003. ^ "The Stepford Wives (2004)". Boxofficemojo.com. Retrieved 2010-09-20. ^ "Stepford Wives 2004 budget details". The Numbers. Retrieved 2010-09-20. ^ "Sings the Peggy Lee Songbook-Bette Midler". Billboard. Retrieved 2011-07-28. ^ "49th Annual Grammy Awards Winners List". National Academy of Recording Arts and Sciences. Archived from the original on December 20, 2006. Retrieved February 11, 2012. ^ "Bette Midler's Array of Awards". Bootleg Betty. Retrieved 2011-07-25. ^ John Katsilometes (November 5, 2009). "Bette Midler's residency at Caesars Palace to end Jan. 31". Las Vegas Sun. lasvegassun.com. Retrieved 2011-07-25. ^ "Bette Midler: The Showgirl Must Go On". Emmys.com. Retrieved 2012-12-18. ^ "Bette Midler – Jackpot: The Best Bette". charts.us. Retrieved 2011-07-25. ^ Robin Duke (December 8, 2009). "The Royal Variety Performance". The Stage. Retrieved 2011-07-25. ^ "Cats & Dogs: The Revenge of Kitty Galore (2010)". Box Office Mojo. 2010-10-21. Retrieved 2012-12-18. ^ Andrew Gans (February 28, 2011). "Priscilla Queen of the Desert Kicks Up Its Heels on Broadway Starting Feb. 28". Playbill. Retrieved 2011-07-28. ^ "BBC News – Bette Midler to receive Songwriter Hall Of Fame award". Bbc.co.uk. 2012-03-08. Retrieved 2012-12-18. ^ "Parental Guidance (2012)". Box Office Mojo. Retrieved 2016-12-01. ^ Ng, David (September 19, 2013). "Bette Midler bringing Sue Mengers play to Geffen Playhouse". Los Angeles Times. ^ Eric Shorey (2013-12-11). "Bette Midler To Star As Mae West In HBO Movie Written By Harvey FiersteinNewNowNext". Newnownext.com. Retrieved 2014-08-01. ^ "Bette Midler To Perform On The Oscars®". Oscars.org. 2012-08-24. Retrieved 2014-08-01. ^ Guerra, Joey (2014-04-28). "Multitalented Bette Midler has all kinds of plans for the future". Houston Chronicle. Retrieved 2014-08-01. ^ "Exclusive: Bette Midler Announces 'It's The Girls,' Her First Album Since 2006". Billboard. ^ "BetteBack: Midler Begins Adopt-A-Highway". BootLeg Betty. 2010-04-29. Retrieved 2016-12-01. ^ Russo, Tom (1995-06-16). "Bette Midler has adopted-a-highway". EW.com. Retrieved 2016-12-01. ^ a b "About NYRP". New York Restoration Project. Retrieved 2011-07-25. ^ "Upcoming Events – Divine Intervention! – Bette Midler". Bette Midler. ^ "TV Awards - 2000/2001 (5th Awards)". Online Film & Television Association. OFTA. ofta.cinemasight.com. Retrieved September 7, 2014. The Films of Bette Midler on YouTube, film clips, 4.5 min.